Pauline has dedicated the past 30+ years to environmental preservation, working for organizations such as The Nature Conservancy, Bishop Museum, Moanalua Gardens Foundation, and Agricultural Leadership Foundation of Hawai'i. Her skill-set has enabled her to assume various positions, from environmental educator and teacher trainer to volunteer coordinator, natural resources program manager, public awareness coordinator, and leadership program director. 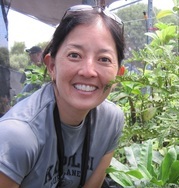 A strong believer in working with partners to accomplish shared goals, Pauline has also served on several boards and councils, including the Hawai‘i Environmental Education Association, North American Association for Environmental Education, Mālama Hawai‘i, Hawai‘i Academy of Science, and the State of Hawai‘i Environmental Council. Pauline’s extensive career in conservation in Hawai‘i has helped her build a broad network among people working to protect natural, cultural, and agricultural resources throughout the state. She is a graduate of the University of Michigan at Ann Arbor with a Bachelor of Science in Natural Resources degree and a Master of Educational Technology degree from the University of Hawai`i at Mānoa. Being a co-founder of Mālama Learning Center gives her immense pride. Chelsey Jay joined the staff after completing her fellowship with the Hawaiʻi Environmental Education Alliance based at the Hawaiʻi Department of Land and Natural Resources and also worked at the University of Hawaiʻi at Mānoa College of Tropical Agriculture and Human Resources. Chelsey is a graduate of Kamehameha Schools and received a Bachelor of Science degree in Environmental Science and Resource Management at the University of Washington. She also recently completed her Master's degree in Educational Foundations at the University of Hawaiʻi. She says, "As a life-long resident of West O'ahu, I feel extremely blessed to be a part of an organization that plays an integral role in sustaining the health and well-being of my community. I'm excited for the opportunity to support MLC's mission, which aligns nicely with my interests and goals in life and look forward to this journey that is sure to be filled with continued learning and growth." Jeremy is no stranger to Kapolei High as he is a proud graduate. He has already given back by being a long-term substitute, part-time teacher, and now full time Biology instructor. Jeremy received a Bachelor of Science degree in Biology at the University of Oregon and completed his certification as a secondary education teacher at the University of Hawai'i. He says, "As a waterman, I often find myself in complete awe when I watch the warm clouds and the dark silhouettes of trees during sunset. To me, nature is beautiful: from the intricacies of the smallest cells to the mating songs of humpbacks, nature is art. As a member of the MLC team, I’m incredibly lucky and grateful to be able to work with individuals who share a similar appreciation and respect towards nature. It is with great honor and privilege to be able to promote the MLC vision and mission so that our community can make conscious decisions regarding their health and the health of the environment." Sayo first joined the Mālama Learning Center as an Americorps Member with KUPU, and soon after took on several roles with MLC. She currently leads our WOW (Without Walls) program. A graduate from the University of California Santa Barbara, she is a multi-talented and educator, craftsperson, and cook. Anything that needs to be done, Sayo can do! A world-traveler and lifelong learner, Sayo also works at Mālama Loko Ea in Hale'iwa, directing education programs centered around the historic Hawaiian fishpond. Hekili Lani come to Mālama Learning Center from Puna on the island of Hawai'i. She attended Kamehameha Schools in Kea`au and then the California Polytechnic State University to study Landscape Architecture. She has always been involved in cultural conservation work since high school, but it wasn't until her college years while missing Hawai`i, that her interests returned to cultural landscapes and preservation of sacred sites. She says, "I am proud to be a valued member of an important organization that preserves, perpetuates and nourishes our land and Hawaiian culture." Eva joins Mālama Learning Center with several interesting connections. We have known her through her work at Camp Pālehua and also as a parent of one of our program's students. Having recently completed her Bachelor of Arts degree in Hawaiian Pacific Studies at the University of Hawai'i at West O'ahu, she says, "As we learn and work together, caring for our natural resources is not only a possibility, it becomes highly achievable. I love the fact that we get to weave our island history with the places that we get to take responsibility for and share our knowledge with those willing to learn and participate. It is here the children of the land, nā keiki ‘o ka ‘āina, are able to plant, e meakanu nā keiki.​"